We are pleased to be able to tell you that a new Independent Members secretary has now been appointed to take over the care of the Independent Members from the much missed previous secretary Clive Jones. Our new Independent Members secretary will be introduced to you with our April website update. First and foremost on behalf of all Independents I would like to pass on our thanks to Neil Micklewright for sitting in for the last three years on top of his other duties within the society. I must admit that being asked to be your new secretary came as a complete surprise and did take quite a bit of thinking about (and a lot of emails) before I agreed to take this job on. So, who is this stranger? 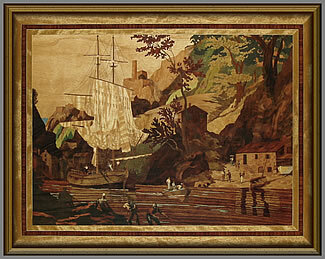 Well, I have been learning about marquetry since I was a teenager and I am now nearly an OAP! I started off using a craft knife and the “stick as you go” method using balsa cement and have slowly progressed to using a scapel and the “window” method. It was put to me that the Independents prefer to be just that – Independent! I would say that as the biggest group we need representation especially on the web site. It is high time that we had a showing of our expertise and abilities for all to see. Our webmaster has provided the space and it is up to us, not me, to use it. All well and good you may say, but how? 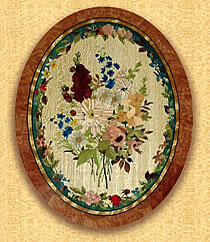 This little oval picture was done for my mother shortly before she lost most of sight, at her request. To do roughly an inch or so of the border took me approximately three hours (an evenings work) so you can imagine it was quite a challenge! Whilst my mother was pleased, you can see that my efforts are not to the standard seen at the Nationals. I practice our art/craft purely for pleasure and enjoyment whilst, at the same time, taking a great deal of pleasure from the efforts of all members, which our Editor/webmaster puts out in the Marquetarian and on the web site. It truly is amazing just how much quality is out there, and that includes our junior members who try so very hard. This picture of a brigantine being warped took about six months of evenings and weekends. It was made about 14 years ago and is now showing signs of joint cracking. The finish is sand sealer and again, it could do with a clean up and re-finish. I have tried to include fragmentation, fine lines (in the rigging) as well as trying to make it look as though the ship and boat are in the water rather than sitting on it. Overall I would say that some of this has worked whilst there is room for improvement with other parts. Why non exhibition items? Given that we have such a large group we seem to be lacking in Exhibition numbers. Well, I am as guilty of that as anyone, but, I do not consider my own efforts to be of the standard seen at the nationals. (I suspect that yours are well up to the mark and there is another reason for it). For those who have taken the time and trouble to enter the national, well done to you all and do please keep up the good work. Having said that, I have acted as a guinea pig and sent a couple of photographs and a write up to Alan as a sample of an online layout, you can see it in the 'box' above. If I can do it, so can you. I might add that there will be no critique, just your items and write up. Now for another idea. Given that the groups have their own portfolio of designs and we do not, also as suggested in the last issue of the Marquetarian. Between myself and Alan we can provide well over 1000 images all of which are either copyright free or belong to the society. There is a mixture of insert line images from old issues of the marquetarian, silhouettes and very nice steel plate engravings. These are suitable for all ages and all stages. They could be put up on the site one or two at a time and be changed, say, each month with the old ones going to an online library of images which of course would mount up over time. Any thoughts or suggestions on this would be welcome. At the end of the day, this is your web page, your chance to shine - your opportunity to encourage our younger members but it has to be done by your and my collective Independent's efforts. Let's show the rest of them how we do it! And now, having introduced myself to you, let me also introduce you to a new service (as outlined above) which will be the beginning of an online library of line drawings which can be used for your marquetry projects. On the next page you will find 18 thumbnail pictures of line drawings with clickable links below them which, when you click on a link will download an A4 version of the picture as a PDF file to your computer. You can then save the file and print out an A4 copy of the picture in the normal manner. Click the following links for the line drawing online library : "Line Drawings" - "Designs Page 2"
For access to more designs which are located in our designs library you will need to enrol yourself as a member of the Marquetry Society in order to acquire the password for the library. Click the following link for our online 'application for membership' facility. The enrolment process should only take you a few minutes to complete, it is extremely easy, here is the link: "membership application". Visit the Independent's Gallery where you will find marquetry exhibits from Independent members drawn from our archives over the last five decades. There's everything there from beginners to Rosebowl winners - and the only critera for this Gallery is that every exhibit is the work of an Independent member - no Group members allowed here! Visit the new Independent's Personal Gallery where you will find the work of Independent Members specially selected from their own archives and collections. We now have a Marquetry Society breaking news & information page (plus our line drawing designs library) available to Marquetry Society members which they can reach by simply entering their current edition password after clicking the 'Enter Protected Area' button below. This helpful training and design resource came on line with the publication of the autumn 2013 edition of the Marquetarian. The latest and now current password for this spring 2019 3 month term can be found on page 4 (Editorial) of the spring 2019 edition of the Marquetarian. Just click "Enter Protected Area", enter the current password when prompted and enjoy your visit to our online designs library. PLEASE NOTE: With the latest series of "upgrades" to the Google Chrome browser you may find that it will not complete the link to the designs pages after you have successfully entered the correct password. This is a problem connected with the Chrome browser upgrades. If you encounter this problem, just use a different browser to access the designs library. It works perfectly with most other browsers.